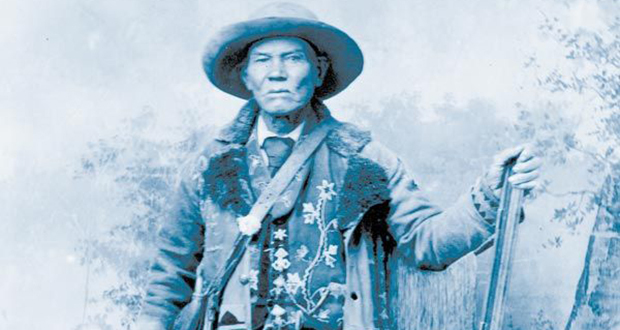 Tom Tobin was a famous American mountain man, and bounty hunter. In 1863, Tobin hunted down one of America's first serial killers, Felipe Espinosa, who killed 32 innocent civilians before Tobin single-handedly decapitated him and his accomplices. Tobin was paid with a Henry rifle for the killings. Tobin explored much of southern Colorado, including the Pueblo area. In later years he was sent by the Army to track down and kill the notorious Felipe Espinosa and his nephew; Tobin returned to Ft. Garland with their heads in a sack. Sarah, believed to have been a Delaware Indian, had been widowed before marrying Tobin. Along with his brother, Tobin worked at Simeon Turley's store, mill, and distillery at Arroyo Hondo. Autobees and Tobin made regular stops in places such as Fort Jackson, Fort Lupton, Bent's Fort, and El Pueblo. In 1847, Tobin farmed on land bordering the San Carlos River southeast of El Pueblo, selling his crops to Lt. Col. Gilpin asked Tobin to serve as a courier, carrying dispatches from the Canadian River valley of Oklahoma to Bent's Fort. Just before the Civil War, Maj. B.L. Beall hired Tobin as a scout to guide an expedition to find a railroad route to California. Beall described Tobin as "Having a reputation almost equal to Kit Carson's for bravery, dexterity with his rifle, and skill in mountain life." In November 1868, Gen. Penrose appointed Tobin as chief scout on an Indian-hunting campaign. He provided Tobin with a detachment of fifteen soldiers, but Tobin left them at camp, as they made too much noise on the trail. Tobin tracked the Espinosas to a camp and shot them. The government had posted a reward for several thousand dollars for the Espinosas, but Tobin never collected the full amount. Tobin tried to stab Carson for abusing Pascualita; the younger man hit Tobin in the head with a sledge hammer and shot him in the side. Tobin and his son-in-law apparently reconciled a few days later, but Tobin never fully recovered from the shooting.